A couple of bighorn sheep on the day I hiked the Grinnell Glacier Trail were aimlessly wandering the area around the glacier. Like much of the wildlife in Glacier, these particular sheep were rather accustomed to seeing people. As such, they didn't really go out of their way to move away from the hordes of people, including myself, that were watching them go about their business. 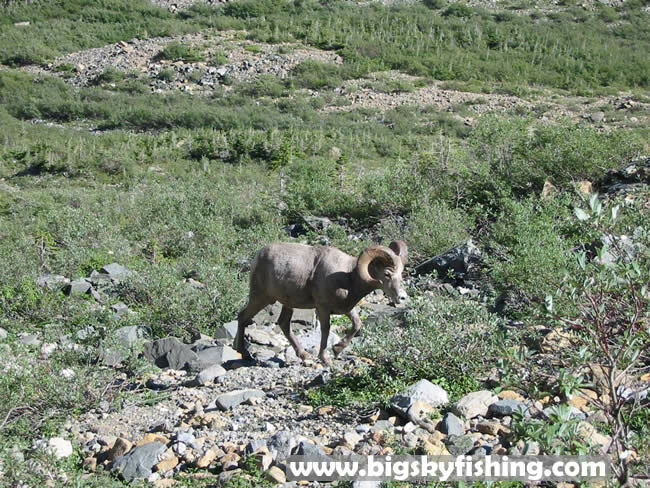 Due to the open views and favorable wildlife terrain the trail passes through, the Grinnell Glacier Trail is an excellent hiking trail to see bighorn sheep, mountain goats and grizzly bears on. Photo Use Guidelines - How you can use our photos for online and offline use.